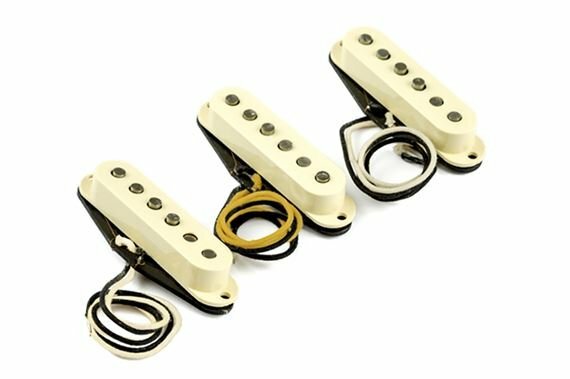 Shop Fender Eric Johnson Stratocaster Pickups Set of 3 from AMS with 0% Interest Payment Plans and Free Shipping. Each pickup is unique in structure and performance. Fender’s R&D engineers worked closely with world renowned guitarist and tone connoisseur Eric Johnson to craft the perfect pickups for his uniquely articulate sound. Carefully blending Leo’s legacy with EJ’s modern discerning sonic tastes, these Strat pickups are a key element of EJ’s unmistakably pure tone. The neck pickup is based on a ’54 Strat pickup with oversized alnico 3 magnets. The middle pickup, based on a ’63 Strat pickup, uses specially treated alnico magnets and is reverse wound to cancel hum when used with the neck or bridge pickup. The bridge pickup uses alnico 5 magnets and is specially voiced to be hotter without sacrificing that sweet top end sparkle. With slightly hotter output than typical vintage pickups and a powerful combination of magnets, these sonically potent and highly dynamic pickups produce the perfect balance of clean, dirty rhythm and lead tones to satisfy all level of players, through any amplifier. Great pickups, great tone and solid response. Took my D'Angelico Deluxe DC, purchased from AMS, and turned in to a Strat / Tele guitar utilizing the 6 position switch. I am very comfortable playing this style guitar. Great Cleans ,( sharp and warm at the same time ). Musically Outstanding!Also the middle pickup is outstanding. Really a great set of Fender pickups! Has restored my faith in Non NoiselessPickups! No doubt a keeper!